SOGI has been a major policy initiative of the Richmond Board of Education intended to address equity issues within schools. There is no doubt that its discussion has garnered attention from not just parents and staff, but also students. 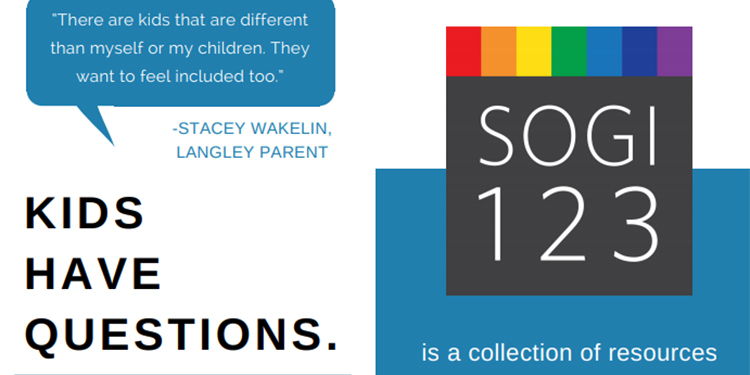 Last spring, I, as a student council member, was invited by the district to share feedback on the SOGI 123 policy. Although I was not quite educated on this matter at the time, I did interview members of the Rainbow club at my school to share their thoughts on the concepts of “inclusiveness” and “equity”. The Table 38 conference in January served as a kick-off event for the Pink Shirt month for February that comes along with the district’s education week. Exactly one year later, on Jan. 15, I was invited to attend a district-wide Table 38 conference hosted by Cambie secondary student council, where two guest speakers from “Outinschools” presented to students across Richmond’s secondary schools their unique experience as members of the LGBTQ community. This event raised awareness about LGBTQ rights in schools. Conference members were encouraged to wear pink as a way to show and support the spirits of inclusiveness. Among the attendees were school trustee Norman Goldstein and Heather Larson. The two guest speakers were Melinda—a mixed-race, queer, femme (language they used to identify themselves)—who serves as a school outreach program coordinator of “Outinschools”; and Kevin, a Quebec-raised writer and filmmaker dedicated to inspiring students through storytelling. The conference began with a short and engaging “Guess and Check” game, in which students, learned the basic terms associated with the LGBTQ community. Melinda, accompanied by her PowerPoint, threw terms like “LGBTQ”, “homosexuality”, “lesbian” and “queer” at students and asked them what they meant. Students showed a lot of enthusiasm in answering the questions. As the questions got harder with some of the less known terms like asexual, bisexual and heterosexual, the chattering faded away. After that, the students entered the discussion period and were asked why supporting gender rights in our district is crucial to the well-being of all students. Common answers like “Richmond is the most diverse city in Canada”, “respecting gender rights ensures safety and equity for all” filled up the engaging discussion among student leaders from across the district. Perhaps the most valuable and unforgettable lesson I learned as a participant is when the screen showed some of the compelling figures and numbers of how the LGBTQ community is being left behind and often ignored by mainstream society around the world. For instance, about one per cent of the population are identified as asexuals, that is 13 millions people being forgotten. “That is 13 millions people being ignored, never and ever were they remembered,” Melinda said. Students including myself had mixed feelings as this last slide concluded the presentation. Overall, the event was well attended with more than 150 students from across the district. “Outinschools” is an educational organization in partnership with “Outonscreen” and “Vancouver queer film festival” that provides learning opportunities for high school students about LGBTQ community.